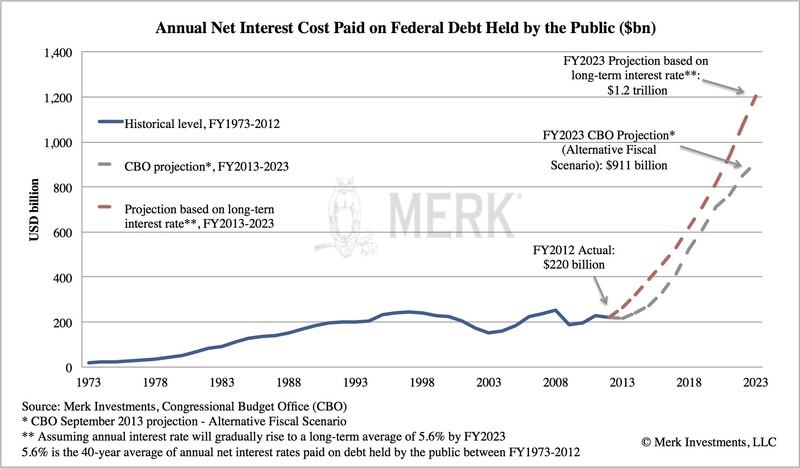 Merk Insights - The most predictable economic crisis? The most predictable economic crisis? Forget about a government shutdown. The quibbling over concessions to keep the government funded distracts from what might be the most predictable economic crisis. We have problems that may affect everything from the value of the U.S. dollar to investors� savings, but also to national security. But we are getting ahead of ourselves. 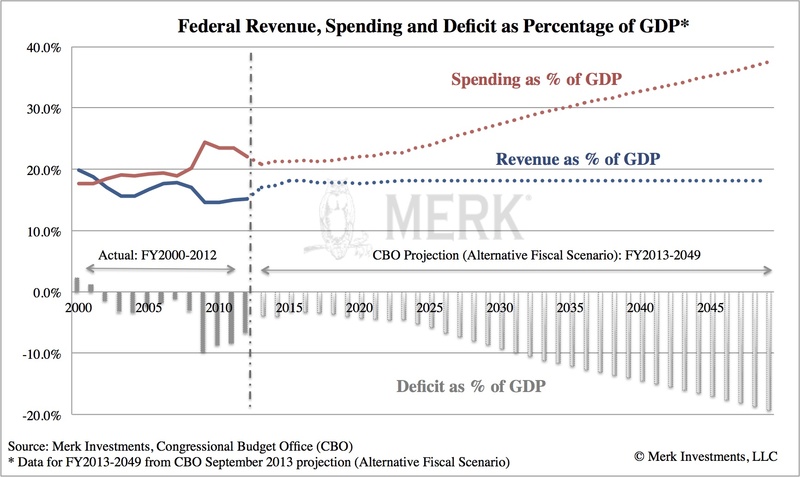 To see why we have a problem, let’s look at the projections of the Congressional Budget Office (CBO); we are using their “Extended Alternative Fiscal Scenario.” The extended alternative fiscal scenario incorporates the assumptions that certain policies that have been in place for a number of years will be continued and that some provisions of law that might be difficult to sustain for a long period will be modified. From 1973-2012, government spending averaged 20.4% of GDP; in contrast government revenue averaged 17.4% of GDP. That equates to an average yearly deficit of 3%. 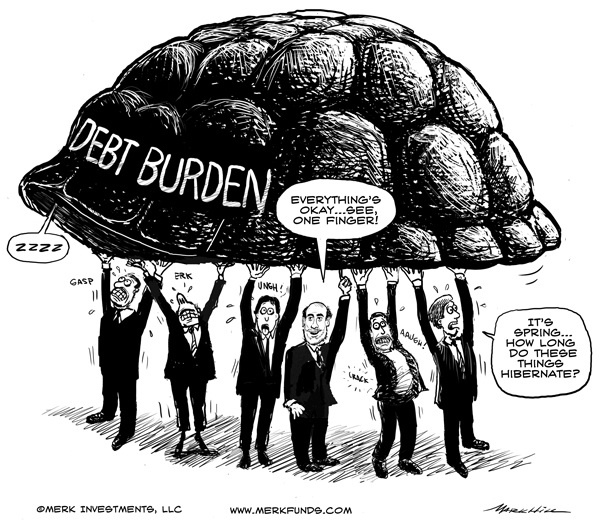 As long as an economy grows sufficiently, it may be able to carry a sustained 3% annual deficit. A future Merk Insight might question this logic, but today’s analysis focuses on a much bigger problem. In 10 years, our annual budget deficit is projected to be 4.5% of GDP. In 25 years, our annual budget deficit is projected to be 13.6% of GDP. In 35 years, our annual budget deficit is projected to be 18.7% of GDP. You might shrug off these numbers as unrealistic given that it’s impossible to forecast 35 years out. However, keep in mind that the biggest driver of expenses in the coming 35 years are known as “entitlements,” taking Social Security, Medicare & Medicaid together, these expenses are expected to rise from 9.3% to 15.7% of GDP; that’s an increase of 6.4% of GDP. If one accepts a substantially larger tax burden, possibly by introducing a national sales tax or carbon tax, one could conceivably finance this increase, although getting the political majority for such taxes might be elusive. 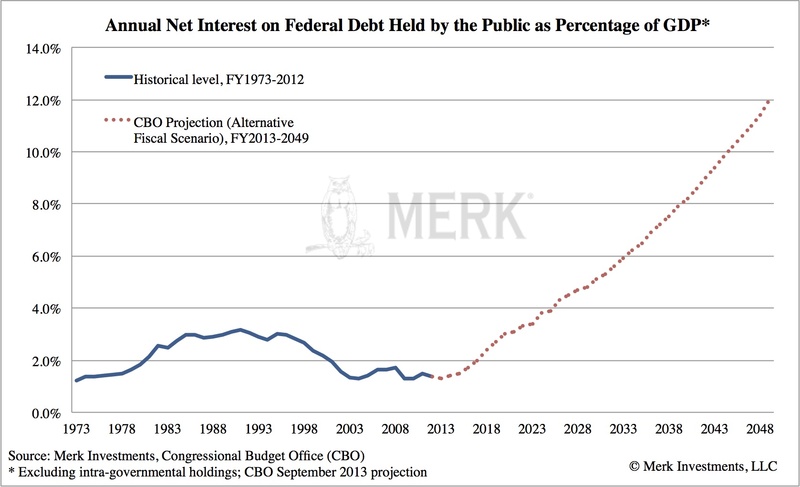 According to the CBO, in 2048, we will be spending almost 12% of GDP on interest expense, compared to just over 1% now. Differently said, as a share of GDP, we will be paying more in 2048 for entitlements and interest expense than we currently pay for all government services combined. Said still another way, even with substantially higher taxes, there may not be any money to pay for the military, education, or infrastructure. In fact, Republicans and Democrats can stop arguing about discretionary spending, as there might not be any to fight over! Mr. Bowles argues, and we agree, that our deficits might be the biggest threat to our national security. Now there’s a thing or two we can learn from Europe. Most notably that policy makers can be incredibly creative when it comes to kicking the can down the road. Culturally, there are differences, too. In Germany, austerity sells. In the U.S., we may be much more tempted to count on the Federal Reserve to help us finance our deficits. As indicated, with the exception of our suggestion that interest rates might move back up to their historic average, the estimates are CBO projections. If there were another military conflict, for example, expenses could easily be higher. So what does it mean for investors? The most obvious choice might be to consider shorting bonds. But while we agree that bonds may be one of the worst investments over the coming decades, be warned that it can be very expensive to short bonds. Markets tend to exert maximum pain on investors; as such, it’s conceivable that bonds hold on much longer than one might think, possibly even rise. During this “wait and see” period, investors shorting bonds have to pay the interest on them. A more effective way to prepare for what lies ahead might be to focus on the greenback. As indicated earlier, the U.S. has a current account deficit. That means foreigners have to buy U.S. dollar denominated assets to keep the dollar from falling to cover the deficits. Higher interest rates might attract investors, but if one believes the Federal Reserve might keep rates artificially low, it also means that Treasury securities would be intentionally overpriced. Less abstractly speaking, if you think the Bank of Japan in Japan or the Fed in the U.S. might try to keep a lid on yields, the currency may well be the valve. In fact, we would go as far as to argue that we cannot afford high positive real interest rates. As a result, the Fed might need to err on the side of inflation rather than cripple the economy. Sure, a hawkish Fed might be able to hike rates in the short-term, but let the economy kick into higher gear. If we look at what happened, for example, in Spain, perception maters more than reality: Spain had very prudent debt management, with an average duration of about 7 years; yet the market started to lose confidence, causing concern in the market that Spain might lose access to the market. Similarly, in the U.S., the numbers above matter little should investors lose confidence. By all means, U.S. markets are deeper and more liquid than Spanish markets. But to us, it also suggests that policy makers will be more tempted to kick the can down the road, only exacerbating the day of reckoning. All the more so, shorting bonds may only be for the brave. Diversifying out of the greenback, however, be that through gold or a basket of currencies, is also risky, but allows investors to potentially take advantage of other opportunities along the way. A more active investor may want to contemplate whether there’s money to be made from the “currency wars” that might rage as different regions of the world address their challenges in different ways. None of these are easy choices, but doing nothing may also be a risky proposition, as the purchasing power of the dollar may increasingly be at risk. Please register to join us for an upcoming Webinar as we dive into these dynamics in more detail. Also make sure you subscribe to our newsletter so you know when the next Merk Insight becomes available.